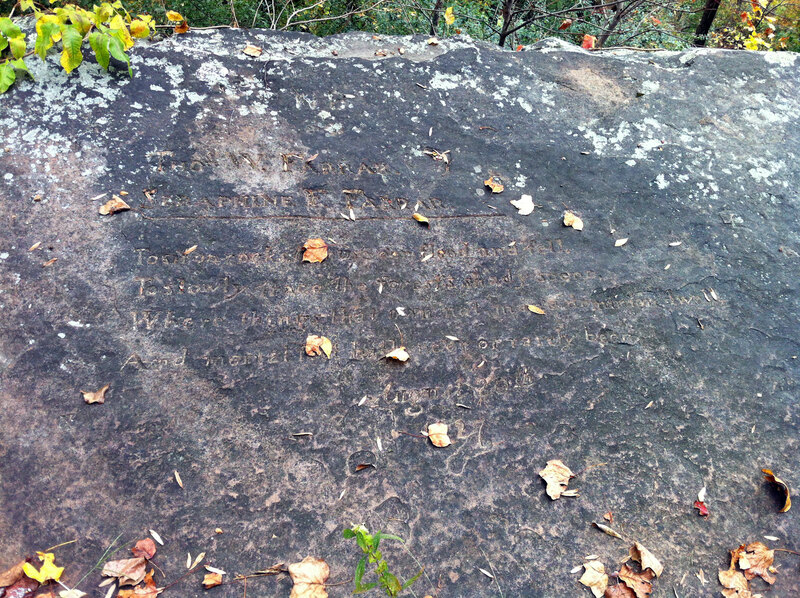 Lover’s Leap inscription. Scroll to the bottom of this post to see my best guess at what it says. Here’s the rest of the pics from the day, plus one more video — the somewhat crazy descent from Crest Lane all the way down through the Green Valley roller coaster. I’ve put some bookmarks into the description on youtube so you can jump to specific spots of the video if you watch it on you tube and then click the timestamps in the description. “…” means I have no clue what that part of the poem says. This entry was posted in Off-season, Training and tagged fall on November 5, 2012 by kartoone. Converse with Nature’s charms, and view her stores unrolled. Great post — looking forward to doing some riding if you’re around during the holidays. Thanks Warren, very cool that this was part of a larger poem. I can see why they didn’t carve the whole thing into the rock. I like what the larger one is saying, too. I can definitely relate to the full poem … never feel alone while riding but stick me in a crowd of people and I’d happily rather be back out riding. Definitely let’s ride when you get back in town!